Need to save money? Sometimes the answer to money woes isn’t by making big financial changes. 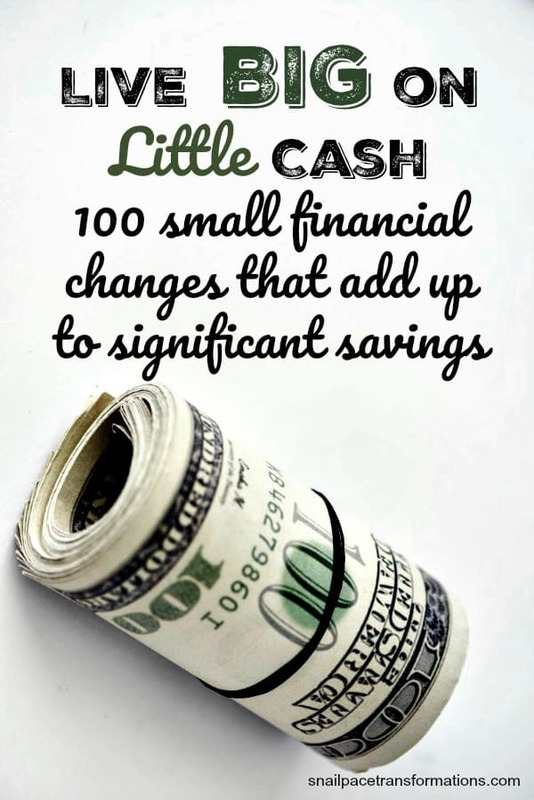 Sometimes it is in making numerous small changes that when added together add up to living on significantly less cash. I got this idea from the book Slaying The Debt Dragon. Each time you grocery shop before you go through the checkout, choose one item to put back. You won’t even notice you didn’t buy it and you will easily save $1 or more each grocery shopping trip. Ibotta: Here is a tutorial I wrote about how to use Ibotta and here is where you can sign-up. BerryCart: Here is a tutorial I wrote about how to use BerryCart and here is where you can sign-up. FetchRewards: Here is a tutorial I wrote about how to use FetchRewards. Use my referral code RE9FU when you sign up and get 1500 points after you submit your first receipt (offer could change at any time). Checkout51: Here is a tutorial I wrote about how to use Checkout51 and here is where you can sign-up. Keeping a simple price book where you track prices of grocery items you buy week after week in different stores can be more helpful to your budget than any other grocery savings method. Finding a way to save even $0.10 on an item you buy one of each week would save you $5.20 a year. That doesn’t sound like much, but save $0.10 on 50 things you buy weekly and you save $260 a year. Don’t forget to compare in-store prices to online prices. I am finding that often Amazon’s subscribe and save program offers the lowest prices for some things. Another online store I use a lot for low priced groceries is Boxed.com, it is like a wholesale store, but without membership fees, click here to use my referral link for boxed.com and save $15 off your first order of $60 or more (offer could change at any time). In the grocery stores in my town I find markdowns mostly on meat. However, I know the selection of markdowns varies depending on what grocery store you have in your city. If you have a Kroger, Crystal of Money Saving Mom has a great article on how to find markdowns in Kroger. Speaking of Crystal, her blog Money Saving Mom is a great one to follow to find out about amazing sales and how to make them even better with coupons. PinchMe: Offers a variety of free samples once a month. To have better chances of qualifying for them, you must keep your profile up to date. Go here to sign-up for PinchMe. Daily Goodie Box: I have yet to receive a box of free samples from Daily Goodie Box, but I have watched others do reviews on what they got in theirs and should you qualify for one, you are in for a real treat. Go here to sign-up for Daily Goodie Box. Money Saving Mom: I recently got a sample of cold brew coffee through an offer posted on Money Saving Mom. It came with a $3 off coupon that I was able to combine with a sale and a rebate offer to get an entire box of coffee for free. 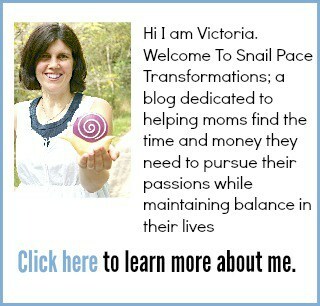 Freebies4Mom: Another excellent site for finding out about free samples. I shop at Meijer so I use their app. In the app, I can clip coupons that are applied toward my purchases when I scan my barcode (provided by the app) during checkout. The app also keeps track of how much I spend and when I reach specific spending targets, it offers me new rewards. I am sure other grocery store chains have similar apps providing similar ways to save. Not only will holding a leftover night challenge you to be creative with your cooking (what can you make with 3 cups of mash potatoes and a half a block of cheese? ), but it will also save you money by stretching your groceries one meal further. You don’t need to create a space in your home to store six months’ worth of food to benefit from great grocery deals. If I see items my family uses on sale for rock bottom prices, I buy just two extras. Doing this has reduced our grocery budget and kept me from having to think creatively as to where to store a massive stockpile of food in a small home. If you don’t know how to cook, the idea of switching to a diet of 100% from scratch products can be overwhelming. Instead, concentrate on making just one new item from scratch each month. Start with something simple like pancakes or waffles or do something as no-brainer as peeling and cutting whole carrots instead of buying pre-peeled baby carrots that cost more. Our family pays less than $100 per month for service to 5 smartphones. Yep, that is right–we spend less than $20 per smartphone for a data, text and talk package. Three of us are part of a family share plan of sorts through Ting and two use Tracfone pay as you go. Why two companies? Some of us wanted iPhones and at first they were not offered at Tracfone. Those of us who wanted them switched to Ting. Now both companies provide iPhone service, but I have fallen in LOVE with Ting’s customer service, so I refuse to switch back even though Tracfone seems to have better Statewide coverage where we live in Indiana. You can find out more about Ting here and when you use this link (my referral link) to sign up you will get $25 in Ting credit (offer may change at any time). Appliances can be power hogs–especially if they are old. In our house, the dishwasher broke over two years ago and it just hasn’t been a priority to fix it with three kids in the house to wash and dry dishes. Our water and electric bills have gone down a combined $30 a month without the dishwasher. After returning from our five and a half month RV trip as a family we never did turn the built-in ice-maker back on in our fridge, opting to use these rugged ice cube trays that we used while traveling. We also didn’t turn our deep freeze back on or our dorm-sized fridge that we had often used as a second fridge since we had gotten used to shopping more often during our travels. My coffee maker was one last appliance we gave up during our travels and never returned to. Now we use a simple ceramic pour over that makes excellent coffee similar to this one, although I am thinking of upgrading to one similar to this one so that I don’t have the expense of paper coffee filters. That is a total of four appliances we gave up and now our electric bill is on average $40 cheaper than it once was. Combine that with our $30 savings in water and power for the dishwasher and our bills are down $70 a month–that is a yearly savings of $840! Pretty much every thrifty person knows these two tips and they do make a difference in your electricity bill while not impacting the cleanliness of your clothing. I have a drying rack similar to this one set up in our larger bathroom. It is expensive new, but I got it at a yard sale and loved how sturdy it is. I also have this metal drying rack which cost less than the wooden one in our travel trailer and it works well. After much experimenting, our family has decided to keep the air conditioner at 75 during the summer and the heat at 68 during the day and 64 at night during the winter. These are the temperatures we are comfortable with. In the summer we are in shorts and t-shirts and don’t feel uncomfortably hot and in the winter we have on sweaters and socks and don’t feel uncomfortably cold. I will admit most winter days you can find me wrapped up in a blanket, but I like the cozy feel of a blanket anyways. I read somewhere that an adjustment of 1 degree can save you 10 percent on your utility bills so don’t feel like you have to make rapid changes. Adjust it one degree at a time for a week or so at a time and chances are your family won’t notice the gradual change. When they do finally complain that it is too hot or too cold, make sure that they are dressed weather appropriate and if they are, you might have to go back up or down a degree. 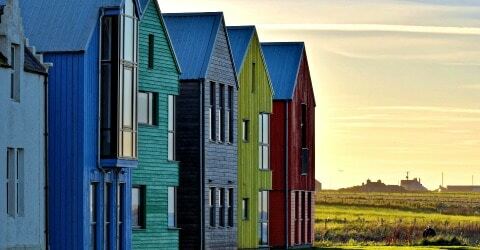 Smaller homes are usually cheaper to rent or buy. They also tend to reduce heating and cooling costs as well as maintenance costs. In the winter open up your curtains and blinds on sunny days and let the sun’s light help heat up your home. In the summer make sure to keep curtains and blinds closed when the sun is beating on them to reduce cooling costs. You can cut the cost of water, electric and soap by giving each person their own color of towel and type of drinking glass–or ones with their names on them. We recently discovered quick-dry travel towels for camping and although they do take some getting used to, they are much thinner and thus you could get more in one load of laundry–decreasing utility costs even further. Do you often turn on your full-sized oven just to bake two chicken breasts or one small pizza? Consider buying a six slice toaster oven. It will save you money on utilities. What other appliances can you downsize? I have yet to do this, but I have read reports of significant savings from families who have. A programmable wifi thermostat isn’t cheap, but it will pay for itself and more if you use it to set the heat lower during the day when you are at work and for it to warm up the home before you return. My mom’s motto for my wardrobe when I was growing up was “one to wear, one in the wash and one to spare.” You don’t need much more clothing than that. Yard sales are super cheap sources of clothing. Make the most of yard sale season by writing a list of your family’s clothing needs before it begins including sizes, preferred colors, et cetera. When my kids were little, I used to drop off most of their outgrown clothing at a consignment store. I then would use the money I earned to buy them the clothing they needed from yard sales. Here are my best tips for selling your clothing through a consignment store. Good quality clothing will not only outlast your need for it, but will resell at a higher price. I often purchase clothing for as much as 90% off during the end of clearance sales. This makes new clothing cheaper than used clothing at most thrift stores and pretty much all consignment stores. Still doesn’t beat the prices at most yard sales though. Ibotta: What I love about Ibotta is that you can use it for groceries, clothing, hardware store purchases and more. Ebates: Ebates has a handy browser tab tool you can download that will alert you whenever you are about to shop at a website where they offer cash back. TopCashBack: If you don’t shop online often, TopCashBack is an excellent option as it doesn’t have a cash out threshold, meaning you don’t have to wait forever to earn enough for a cash out. These three websites give you cash back on online purchases, making online clearance sales even more rewarding. Poshmark: Download the app and use my invite code SNAILPACER during sign up and earn $5 in credit after your first purchase (offer could change at any time). Online consignment stores are more expensive than yard sales and most thrift stores, but if you need a specific item and end of clearance sales are a long way off, they can be a cheaper solution than buying new. 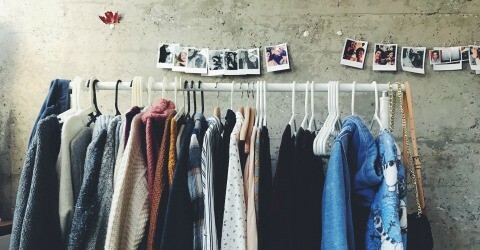 Our wardrobes would be pretty dull without a few trendy items to jazz them up. However, these items usually go out of style quickly and rarely make it to the secondhand market while they are still on trend. That is why I like using stores like the three listed above for finding inexpensive trendy items. Most thrift stores either hold regular sales, offer discounts on specific colored tags each day, provide a frequent buyer card that can earn you discounts or might even do all three. Just ask at checkout if your local thrift store offers any discounts. Get your friends together and host a clothes swap night. You can either make it just women’s clothing or clothing for the entire family. I haven’t had cable in so long I have no idea what it costs, but I do know it indeed is something you can live without. The only exception is if you have a die-hard sports fan in the house, but even then I have heard of several live streaming options for sports that may be cheaper, including Sling. For local news lovers a digital antenna should bring in the local channels super clear. If you already live without cable chances are you have at least one streaming service like Netflix–consider giving them up. Yes, it is true most of these services cost between $10 and $20 a month, but that starts to add up when you have several. For video lovers, if you are already an AmazonPrime member, the Prime Video that comes with the membership offers such a good selection you don’t need another streaming video and TV show service. If you have a Roku, you can add dozens of free streaming channels to the menu. These combined with a digital TV antenna that can bring in the local channels should give you enough choices of things to watch. And don’t forget your library. 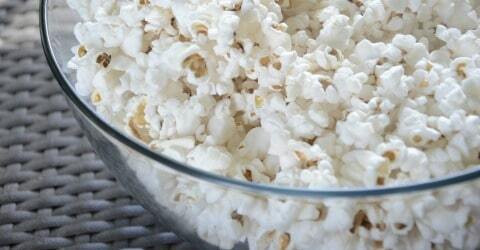 If they offer apps like Hoopla, you can borrow a limited number of movies each month for free. For music lovers, again if you are already an Amazon Prime member, their Prime music area has plenty of choices. If not, Pandora radio has an excellent free,option I use it all the time. And again the Hoopla app offered for free to members of many different libraries have music albums you can borrow and download to your device for a set amount of time. Libraries, colleges, churches and community centers are usually treasure troves of free family-friendly events. Your local paper might have a section devoted to free events. If not, websites or social media sites for those places I mentioned might have a section for upcoming events. I know I mentioned the library in the free activities section and the streaming services section, but I think it deserves a section all its own. Libraries offer so many different kinds of entertainment for free including story hour, puppet shows, DVD rentals, books, audiobooks and so much more. Visit your local library and explore all the free entertainment it offers. It can be expensive to invite a few families over for dinner and feed them all a meal, but if you all bring one dish, the expense is split between the families and you all get to enjoy each others company. I have never once heard someone complain about bringing a dish to a potluck at a friend’s home. If you don’t want to ask your friends to bring anything, consider hosting your event during “off meal” hours. Have a muffin and coffee morning gathering or a pie and ice-cream after dinner social. These will save you the expense of making a full meal. Avoid the cost of having to buy new by trading what you have with friends. This can work with books, board games, DVDs, CDs, kids’ toys, sports equipment and more. For Free Audiobooks, visit your library first and see what apps they offer for free audiobooks. If your library doesn’t offer such apps, then check out the Learn Out Loud website. For Free Ebooks, check out Noisetrade and again the apps from your library. And if you are an Amazon Prime member, don’t forget they have a selection of ebooks you can borrow for free. For Free Paperbacks, I love the site My Reader Rewards Club for free Christian paperback books. When I am finished reading them I pass some on to friends and others I place in Little Free Library boxes where I can then grab a new book to read for free. Use this link to sign up for My Reader Rewards Club and start your account off with 25 points towards your first book (offer could change at any time). For Free Magazines, I use the site RecycleBank to earn points that I can cash in for free magazines. It is super easy to earn points and it doesn’t take long to get enough for a year subscription to some of the most popular magazines out there including Real Simple, Reader’s Digest, Oprah, and more. Go here to join RecycleBank. Swagbucks offers a few free games to play in their “play” tab of their home page. Play them each day and earn gift cards. You can earn up to 10 points a day playing these games. Amazon gift cards start at 300 points for a $3 gift card, meaning you can earn a gift card a month just by playing games. Join Swagbucks here. Search Google for a listing of local parks with playgrounds, walking trails and free disc golf courses. The free version of the AllTrails app should have listings of hiking trails in your area. If you want to give camping a try, check out the free Campendium or iOverlander apps to see if there are free camping spots in your area. One thing I want to mention before you read these ways to save money on eating out–please do not be stingy with a tip. Your tip should be based on what the meal would have cost if you were to have paid full price and ordered drinks. Read this post where I share over 50 different restaurant apps you can download and earn free rewards with. Water is free and doesn’t add calories to your meal. For our family of five, ordering water saves us $10 or more each time we eat out. Living Social is the daily deal app and website I use the most for restaurant deals. 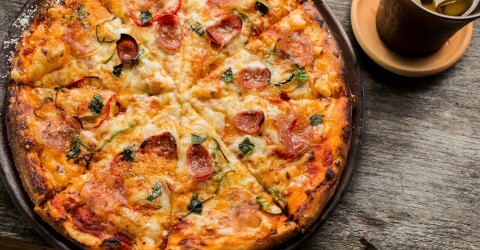 If you like trying out locally owned restaurants, be sure to check out Restaurant.com for discounted deals. Coffee and dessert will cost you less than a meal, but still let you chat with your company. Here is a list of 15 places where you can earn gift cards–most offer gift cards for restaurants. Some offer ways to earn points such as searching the web or shopping online; my guess is you are already doing that so why not earn gift cards for it? Swagbucks–read 10 simple ways to earn gift cards with Swagbucks here. InstaGC–read my 4 favorite ways to earn gift cards with InstaGC here. MyPoints–read about how to earn gift cards using MyPoints here. PrizeRebel–read about how to earn gift cards using PrizeRebel here. Branded Surveys–this company was once called MintVine. SurveyJunkie–read about how to earn gift cards using SurveyJunkie here. FetchRewards–my referral code is RE9FU. Enter it when signing up and earn points. Ibotta–read my tutorial on how to use Ibotta here. Shopkick–read my tutorial on how to use Shopkick here. Breakfast and lunch menus tend to be less expensive than dinner. Fast food restaurants like Panda Express and Fazoli’s offer family meals that work out to be cheaper per serving than ordering individual meals for everyone. My husband and I do this not just because it is cheaper, but because we really do love bread and butter and chips and salsa that much! However, remember to tip like the two of you ate an entree each and paid for drinks. Here is a list of over 50 places where Kids Eat Free. In our state, campsites at state parks are $30 a night–that is significantly less than a hotel. Here is a list of items you need for camping. Here is how to save money on camping supplies. Do you have a friend or a relative that you want to visit who also lives in a great place to explore? Can you camp free on BLM or National Forest land? If you are driving, pack a cooler full of drinks and snacks. If you are flying, you can still pack snacks. Most hotel rooms now come with a refrigerator and a microwave. Take some time before you leave on your trip to write out meals you can make with just these two items. Also find out where the nearest grocery store to the hotel is so you will know what types of pre-made meals it offers. Does it have a salad bar? A deli? Does it sell rotisserie chickens? To vary your meal choices in a hotel room with just a fridge and microwave, consider packing an electric skillet, crockpot or both. Of course, this only works if you are driving to your destination–kind of hard to pack either item in carry-on luggage. Most families want to try out at least one local restaurant when they travel. You can save money on those meals too by applying my tips in the eating out section including watching daily deal sites and Restaurant.com for deals. Just punch in the city nearest your destination for deal listings. Admission prices can add up quickly! To avoid wallet bruises pick perhaps one or two places during your vacation that you have to pay to get into and then make the rest of the things you do free. Use my suggestions in the entertainment area of this article to find free things to do in the areas you are planning to visit. Hotels are often cheaper in off-peak seasons. You can also get more rides for your money at theme parks due to shorter lines. It is typically easier to find daily deals and such for reduced admission to parks and more when kids head back to school. Homeschoolers take full advantage of this. Instead of heading out of town for vacation, have one in your own city. Make sure you pick something special to explore each day and set ground rules so that one person isn’t stuck doing all the tidying up all week while the others relax. Tourist trinkets are expensive and often quickly become clutter. Do your wallet and your home a favor and take pictures instead. When you get home use these ways to find free photobook and printing codes to create memorable art and memory keeping books from your vacation. I keep a tote like this one in our downstairs closet and keep it filled with items I find for 75% off or more that would make great gifts for co-workers, friends and family. This has saved me from going out to buy a last-minute gift full price more times than I can count. At the beginning of each year sit down and list all the events you need gifts for and all the people you need to buy them for. Keep this list handy and whenever you see items marked down 50% or more, take it out and see what gift needs you can fill. Sometimes, but not always, giving DIY gifts are cheaper than giving store-bought gifts. If you have talent and inexpensive supplies, consider if making your own gifts rather than buying them would be cheaper for you. Sometimes you can get a better price on items if you buy in bulk. Other times you might find an awesome item you know several people on your gift list would love marked down to 80% off retail. 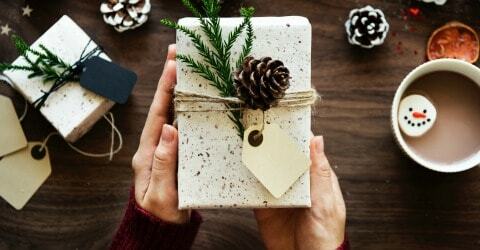 Take advantage of these ways to save money on gifts. No one cares that you gave them the same thing as someone else if the gift is well suited to them. If you normally spend $25 per gift, but shop last minute, see if you can spend under $20 per person by shopping earlier so you can take full advantage of clearance deals. Retail price matters more than what you paid for it when it comes to gifts. You can save money on stocking stuffers by filling a lot of the space in them with those movie sized boxes of candy you can get for $1 at the dollar store. If you have several kids of similar ages with similar tastes, you can break up sets and put one item in each of their stockings–such as lip balm or matchbox cars. One year I found a huge bin full of like new K’nex at a yard sale. I saved it and gave it to my son as a Christmas gift that year. He loved it! His set grew way bigger with that yard sale gift than it would have if I had to spend my budget on a new set. I have also bought new in the box items and used them as gifts. This has to be done tactfully, but it is possible to drop a few people from your gift list without hurting their feelings. 69. Save up points all year through point programs offering Paypal, Amazon, and Target gift cards and then in November cash them in to help pay for Christmas. If you are going to regift an item, make sure that you don’t give it to someone who knows the person who gave it to you. As for me, I tend to take gifts that just were not my taste to white elephant gift exchanges–as long as the original gift giver will not be attending. Even though that gas guzzler may be a thousand dollars lower than the fuel-efficient car beside it on the car lot, remember you have to consider gas prices and how much you will drive your vehicle over time. A slightly more expensive yet fuel efficient car could save you more than that original thousand dollars you saved. This isn’t practical for many, but the closer you live to work the less you are going to spend on transportation and as a bonus, you will get more time at home. When you finish paying your auto loan, don’t stop paying it! Instead, pay it to yourself. 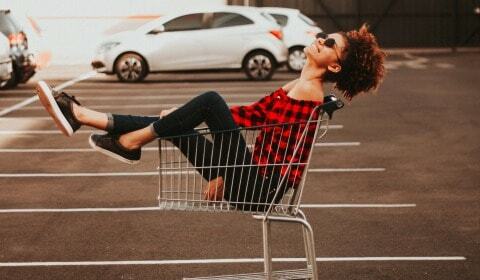 If your budget needs a bit more wiggle room perhaps reduce the amount by $50, but save the rest so you never have to go into vehicle debt again–this will save you from paying interest. The GasBuddy app will help you find out where the cheapest gas is when you need to fill up. It will also alert you when it looks like gas is going up considerably in your area. In our area, you get $0.05 off per gallon when you pay cash. That adds up over the course of a year. A vehicle is more fuel efficient when its tires are properly inflated. Plus with regular maintenance, you can catch problems while they are inexpensive to fix instead of fixing them when they cause more damage and thus cost more to fix. In our family we currently have four drivers and three vehicles, and it works for us because I work from home, and my husband only works a mile away from home. What works for your family? Experiment a bit and see if you can keep one of your vehicles parked for a set amount of time–a week, a month–and if you can do it with little effort, perhaps it is time to get rid of one and save money on insurance and upkeep. If the errand you need to do is two miles or less and doesn’t require you hauling home pounds of stuff, walk. If the errand is under six miles, could you bike? For some people in poor health, these limits might need to be lower. For those in better health, they might consider higher limits. Either way, leaving the car at home will save you money. If you live in a city with an excellent public transit system, perhaps you don’t need to own a vehicle at all. Try it out for a month and see if the transit system in your city works for your transportation needs. In my article 19 Ways To Make Money With Your Smartphone, I listed several jobs you could do using your vehicle that you can set your own hours for. 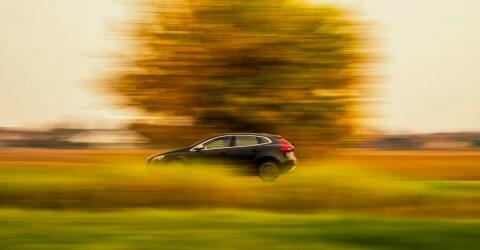 These streams of income could help offset the costs of owning a vehicle. Here is my Pinterest board full of homemade cleaner recipes, most of which cost just pennies to make. 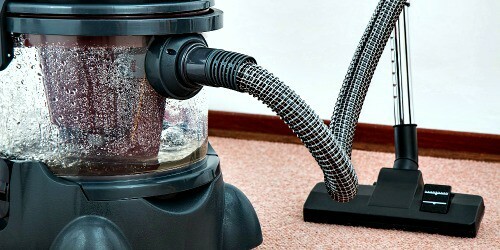 It has been my experience that homemade cleaners in general work just as well as commercial cleaners. In our neck of the woods, it costs on average $25 or more to get your lawn mowed. It costs around $200 for a basic lawn mower and it seems like we go through about a gallon of gas a month with ours. That means in just over two months you would break even making that purchase–the rest of the life of the mower you would be saving money. Very few individuals can fix everything that can go wrong in a home or with a vehicle, but use those talents you have to fix what you can so that you can save money to spend on those repairs you just can’t fix yourself. 84. Can a replacement part from Amazon save you money? Replacement parts from Amazon have saved our family so much money over the years. We are talking thousands of dollars. YouTube is where we find out how to fix something and then Amazon is where we order the parts to fix it. Together the pair is a thrifty person’s ultimate toolkit for repairs big and small. If you are putting off repairing something due to the cost of the repair–don’t. Chances are the problem is going to get worse and so will the bill to repair it. We discovered while renovating our $10,000 home that hardware stores tend to have seasonal clearance sales just like clothing stores. At these sales you can get deeply discounted tiles, light fixtures, faucets and more. At yard sales or through Facebook marketplace you can find almost anything you need in the way of furniture for your home for at a fraction of what it will cost for new. One reason I love secondhand furniture so much is often I can buy well made wooden furniture for much less than the new pressboard cheapos available at most department stores. These pieces will last longer than the new pieces and their resale value is much higher should I decide we no longer need them. It is a win, win and win situation. Perhaps you need a hand figuring out how to fix your leaking sink and your buddy is stumped as to how to fix the dryer–but you know how. Work together to fix both problems and save money while spending time together. Need a table saw? See if you can borrow one from a friend and let him or her know that next time they need a tool, they can ask if you have it and if you do, they are free to borrow it. These types of sharing relationships can save you significant money and give you a chance to help others. 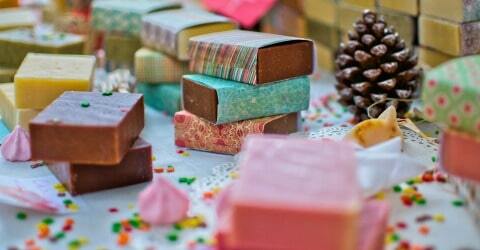 I have a Pinterest board full of homemade beauty products from skin cream to deodorant and more. I have tried out several recipes on it and have been happy with the results of most of them. I purchase several of the personal products I don’t make by myself from Amazon in bulk at lower prices than I can get in the stores near me. Boxed.com also offers reasonable prices on warehouse sized personal products with no need to purchase a yearly membership. Use my referral link for boxed at checkout and get $15 off your first order of $60 or more. (offer could change at any time). When we had a beauty school in our town I used to go there and get my hair cut and my kids’ hair cut all the time. It was $7 a haircut, which is cheaper than Great Clips–that adds up fast over a year. Beauty schools are also great places to get cheaper pampering treats like manicures and pedicures. I cannot cut hair, but I know a lot of people who can–if that is you, then save money by doing it. You can also save money by doing your own manicures, pedicures, hair dyeing, perming, et cetera. Can you use fewer products and still achieve the look you want? Can you use less of the products you do use and still get great results? Doing either will save you money. Hand soap and body wash and dishwashing soap can be put in foaming pump containers like these to save money. When I do this, I fill the containers about half with soap and half with water. You can adjust the ratio to your liking. I find a bottle of soap lasts us four times as long when I do this. Here is my post on how to get the last drop of product out of several different types of containers. This thrifty practice will save you more money than you might think. We don’t use dryer sheets or fabric softener. I shave my legs using soap or conditioner instead of shaving cream. I know others who don’t buy paper towels–they use rags instead. Rethink each cleaning and body product you buy–do you really need it? Coupons for cleaners and personal products like toothpaste, deodorant and such are plentiful. Here are a few online printable coupon sites to check before you go shopping. If you can’t cut hair and you don’t have a beauty school in town, try GreatClips. Their haircuts are always reasonably priced and they are always giving out coupons to cut the costs even further. 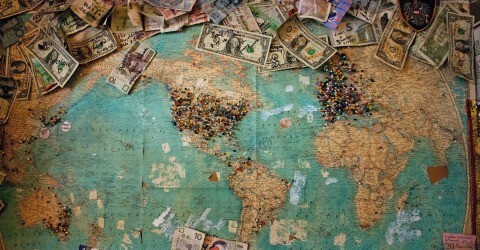 Want To Not Just Save Like A Thrifty Person, But Also Think Like One? 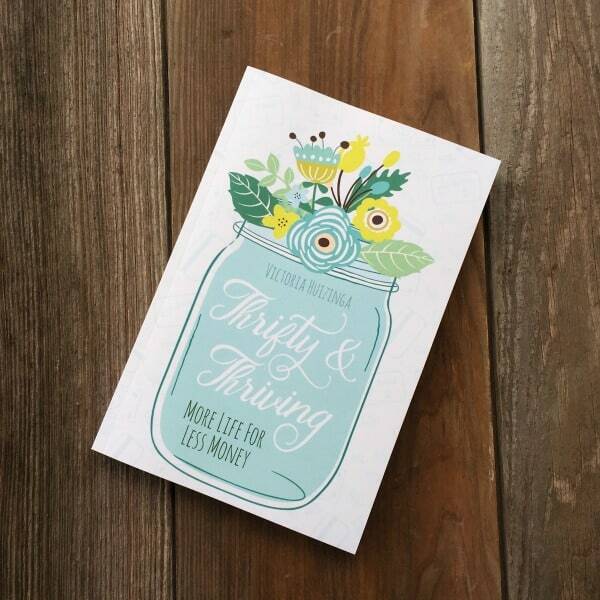 My book Thrifty And Thriving: More Life For Less Money is not your typical “how to save money” book. It does not list 25 ways to save on food or 10 ways to decrease your electric bill. 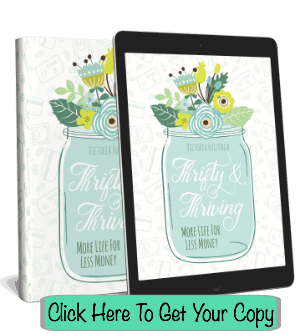 Instead, it shares more than 40 key practices and principles that thrifty families use every day. Available in Paperback and Kindle version on Amazon! Get your copy here.